Ironies abound. Salman Khan, the man, will be paraded before court in a few days on his sensational hit-and-run case. India and Pakistan, after giving the impression of being serious about ‘friendship’ with a prime ministerial hobnob in Russia, are again on jingoistic mode. And in typical Bollywood fashion, Salman Khan, the star and actor, celebrates Eid with another potential INR200 plus-club-movie about Indo-Pak cross-border oneness that will help build another halo around him on his abounding sense of humanity, brotherhood and resolute commitment to truth, with Bajrangi Bhaijaan. It is hard to separate the man from the star, and ‘reviewing’ a Salman Khan movie is not worth the trouble at all. His fans are going to love him and the rest are going to find fault no matter what. Perhaps it is coincidental that Bajrangi’sstory is by Vijayendra Prasad, who also penned the magnum opus Bahubali. Prasad has an uncanny knack to bring out every possible emotional dimension with his larger-than-life movies. He repeats that, in true masterstroke. Directed by Kabir Khan, Bajrangi Bhaijaan, for all practical purposes, is a modern fairy tale without any of the works of ‘big’ movies. In place of costly sets, elaborate costumes and dollar-draining CGIs, Bajrangi has Salman Khan. His star persona is to Bahubali’s multimillion dollar special effects. One man versus an army of visual graphic experts, if you may. Taking home an absolutely adorable kid, speech-impaired to boot, from India to Pakistan by a (Hindu)-god fearing simpleton is perfect recipe to win over the masses. Bajrangi does that unapologetically. So we have the cross-border journey of Pawan alias Bajrangi (Salman Khan) and the sweet-little Shahida (Harshali Malhotra) during which we are reminded us of how the two countries are one in spirit, how humanity is all-pervading, how religious and uncalled-for patriotism can all be overcome by unconditional love. There are many a poignant moment that will make you shed a tear, if not cry copiously. Picture this: A little girl, unable to express her sorrow and helplessness, watch a train chug away with her mother into the darkness! Which human heart won’t bleed for that? And which hard-hearted’s core won’t melt when she finally runs into her mother’s arms (set against scenic Kashmir) even as her saviour is being brutally beaten up by the police? 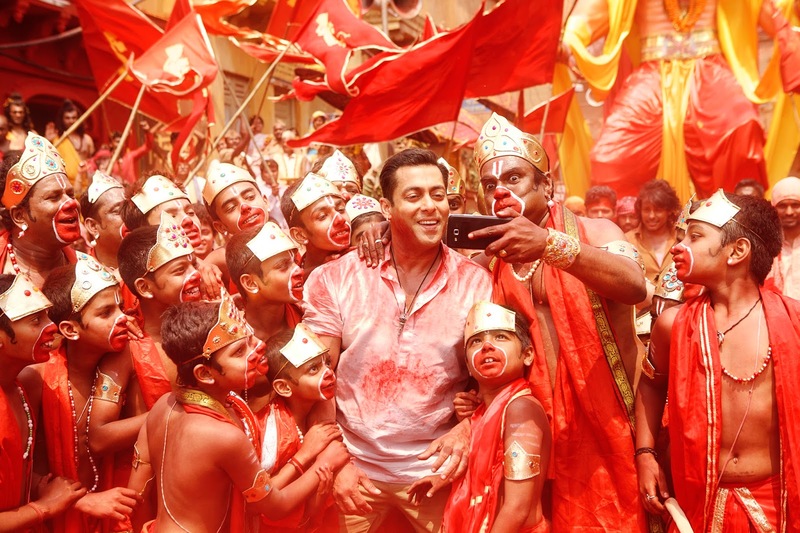 Bajrangi Bhaijaan attempts unabashedly to make you ‘feel.’ And it works. You can hear sobs in the theatre followed by stand-up applause in that ‘love conquers all’ climax. So here is Bajrangi Bhaijaan, with spectacular photography, highly effective background score, foot-tapping music, an adorable kid who walks into your heart with her expressive eyes and silent presence, and yes, Salman, in a role tailored to make him endearing. Playing well to his strengths and weaknesses, Salman happily plays second-fiddle to everyone (including Kareena Kapoor Khan) and not least to Nawazuddin Siddiqui, who once again proves that co-star or not, convincing storyline or not, he will breathe life into any role. As the Pakistani reporter who comes to the aid of Pawan, Nawazuddin could not have been a safer bet. If you are up for three-hours of breezy entertainment (not being bothered about reality), happy to gloss over plot-holes and simplistic approaches, even if you are not a Salman Khan fan, Bajrangi Bhaijaan might satisfy you. After all, it is a feel-good fairytale; reality can go take a walk.